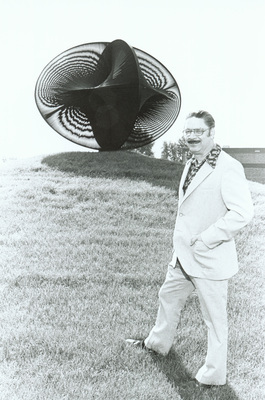 "Dr. Lee Smalley visits ITC June 1980 by Dan Grevas"
An image of the Industrial Technology Sculpture on the campus of the University of Northern Iowa in Cedar Falls, Iowa. The sculpture by Robert Engman was installed northwest of the Industrial Technology Center in 1979. The medium is Cor-Ten steel. "Dr. Lee Smalley visits ITC June 1980 by Dan Grevas" (2019). Art on Campus Photographs. 47.